The most recent issue of the journal on contemporary Spanish theater Estreno features an article about the play "Obabakoak", directed by Calixto Bieito. 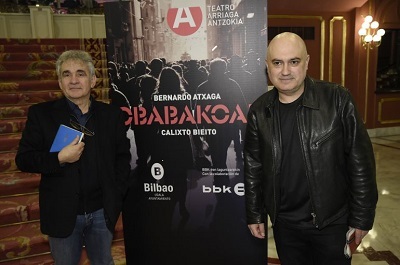 Several months ago, director Calixto Bieito adapted Bernardo Atxaga's best known novel, Obabakoak, for the stage. Bieito characterizes the stage version as a multimedia symphonic poem, a formulation that aptly distills the keys to the mis-en-scene. Begoña Gómez Sánchez wrote an article about the play in Estreno, a biannual academic journal on contemporary Spanish theater published by Austin College in Texas. Here is the article’s full reference and a link to the article in PDF format (in Spanish).